Has your speeder had one too many hits by bosses or just doesn’t have the speed you thrive for…well fear not bring your swoop bike or pod-racer by Moe’s Swoop Garage. They are here for all your fabrication and engine needs. This is the heart of this week’s guild, a small swoop garage shop located on Ord Mantell. However there is a bit more to this swoop garage than meets the eye. So park your speeder in one of their service bays and get to know a bit more about this RP guild. 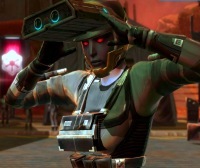 SWTOR is making some changes to their security to help prevent accounts from being hijacked. Everyone will be required to sign-in to their account with their display name by April 2nd, 2013. This applies both to logging into the game and the SWTOR website. Phillip, who works for BioWare in security, has been answering players’ questions and concerns about this change in an ongoing thread on the SWTOR forums. I would urge you to read through the changes at the official post and then go read through Phillip’s posts. As a note, you can go ahead and start using your display name now to login to the game and SWTOR website.